Arthur Walter Parker was born in Saffron Walden in 1892. When he was just seven, his father died. On leaving school, he had a couple of jobs in banking, in Saffron Walden and Cambridge, before the First World War broke out in 1914. At the outbreak, he was deemed too short to enlist, so he worked for the Ordnance Survey department, in the Forest of Dean area. By this time, he had moved to Gloucester, where he met his wife-to-be after joining the local tennis club. In 1916, the army height restrictions were relaxed, and so Arthur joined up and became a Corporal in the 5th Bedfordshire Regiment. After training in England near Tring, he went to France. He was part of an early morning attack, going over the top at 3a.m. 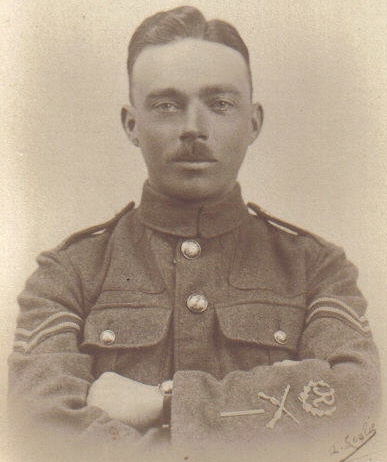 on April 28th, 1917, at Arras, but “…had not gone 150 yards when I got a machine gun bullet in my left shoulder…” He made it back to a Casualty Clearing Station, where an operation was performed on his shoulder, and he was eventually evacuated by ambulance train. He later contracted erysipelas and for a while was dangerously ill. Once he recovered, he was sent to Berkhampstead barracks as a Drill Instructor. He was married in Wales, as his wife’s parents lived there, before the end of the war. His father-in-law was a school headmaster, the youngest in Wales when appointed. After the war, Arthur could not find a job as a surveyor, so he stayed in the army for a time, before moving back to Saffron Walden. In 1921, a job became available with Mr Wallace A. Foll in Woburn Sands, and Arthur moved here, firstly to Mrs Fryer’s lodging house in Aspley Hill. After starting a family in 1921, they moved to the first Council House available in Woburn Sands, which was 51 Theydon Avenue. In 1949, the family moved to 1 Hardwick Road (known as “Heatherlea”), and later bought their house from their landlord. Arthur stayed with his firm for 37 years, and eventually it bore his name as “Foll and Parker”. As well as his family and work, Arthur found time to become clerk to the Woburn Sands Parish Council, from April 1933 to November 1945, and returned to serve as a Councillor himself from May 1952 to May 1961, including being Vice-Chairman in 1955. He also served on the Parochial Parish Council at St Michael’s. In the mid 1960’s, the Woburn Sands and District Society was formed, and Arthur’s knowledge of local matters was to form an invaluable part of the Society’s work. In 1975, he was part of a group which studied local history, and produced the book, “The Story of Aspley Guise – The success of an English village“, which was published by the District Society in 1980. In his retirement, his great passion was local history. His career had been spent in land and property deals, as well as his time with the council, and this meant he had an unrivalled knowledge of almost every building and family in the area, which built up into an almost complete history for the land and buildings in Woburn Sands and Aspley Heath. With permission from owners, he studied deeds and contracts to piece together definitive development histories. He also talked to the older residents about their memories of the village whilst it was still in living memory. All this information was put together into several large unpublished manuscripts, which are now deposited at the Bedfordshire Archives and Record Services at Bedford County Hall, and forms part of 102 catalogued items in collection X395. Included in the deposit are plans and indexes for St Michael’s graveyard, genealogy of leading local families, census return transcripts, historical documents and deeds, sales catalogues and much more. He produced a special research project on the toll-road which led from Hockliffe, through Woburn, Woburn Sands and Wavendon, to Newport Pagnell, and copies of it are lodged at both Bedfordshire and Buckinghamshire county archives. 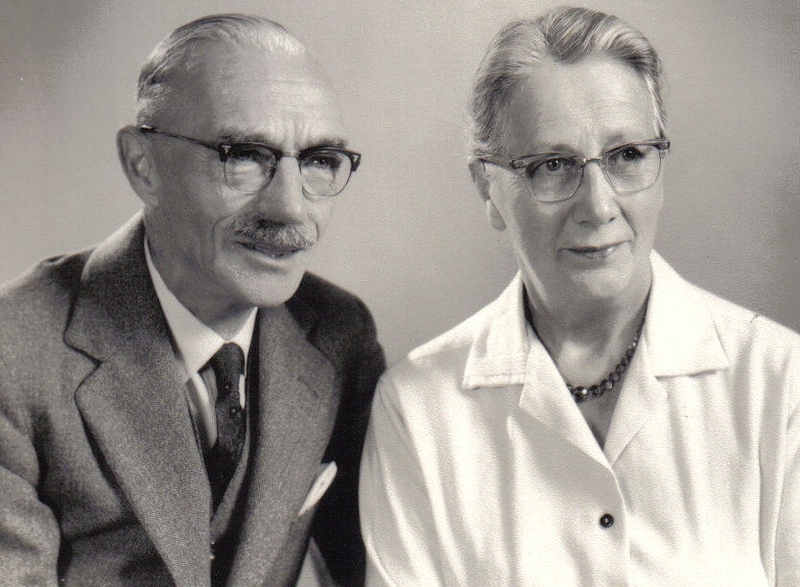 He also proved of invaluable assistance to other family history researchers, such as Joyce Perry, who produced the book, “The Perrys of Aspley Guise“. Arthur died January 2nd, 1984, aged 91, and was buried at St. Michael’s. His daughter still lives in the town today. I am indebted for her continued permission to use so much of her fathers excellent work as the basis for some of this website, and also the printed work I have produced in the past. His work was the first introduction I had to local history when I started researching my parent’s pub, “The Fir Tree” in 1989. The Woburn Sands and District Society was kind enough to loan me their copies of his manuscripts, which provided the groundwork for that project, and became the first sources I turned to when producing my books on the histories of “Down and Needham – A Home Brewed Success Story”, and “The First World War Casualties of Woburn Sands and Aspley Heath”.